To become a member, please reach out to your local club and they can help you through the process. Click Here to access the application on the Skål International website. 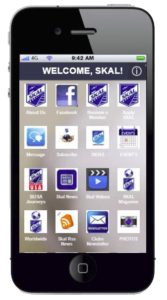 Click Here to see the Skål Membership Handout. Get instant updates and notifications from Skål. Never be out of the loop, always stay connected! Please contact the nearest Skål International USA club for more information on local and national dues. Click Here for local Skål USA club locations. Financial assistance for membership development and special events will be available from the special Skål International Membership Development Fund as reflected and approved in the budget presented at the General Assembly. Assistance will be available for the formation or reactivation of a Club and a substantial net increase in the number of members in a Club. Applications for financial assistance must be approved well in advance (minimum 3 weeks prior) of the event and will be paid on presentation of the performance report and the appropriate invoices following the event. Retroactive requests for assistance will not be considered. It is expected that Skål Clubs that are members of a National Committee and who apply for funding assistance from Skål International should also seek funding from their National Committee. In principle, funding should be provided on a three-way split up to a maximum amount of 300 Euros from Skål International. National Committees looking for support for a national event or trade show (not an international event) can request up to 500 Euros and those applying for assistance with an international event or trade show that Skål International is not already supporting can apply for up to 1000 Euros. SIUSA will match all financial assistance approved by Skål International for use as membership development funds by SIUSA clubs. The Executive Committee will decide each case on its merits. The Executive Committee’s decision in this regard will be final. Click Here to download the Membership Development Assistance Fund Application. Membership recruitment and retention are very important to the success of the organization. Click Here for a powerpoint presentation on Skål Membership Development Operational Plan. Click Here to download the Skål International's Roadmap to 2020 Plan.